1. Increases your sales up to 25% According to marketing researches, plugin functionality can increase sales up to 25% depending what amount of discount you choose. 4. 24/7 support You can write us at any time you need and we will resolve your problem as soon as possible! eCommerce Booster allows you significantly increase your sales. 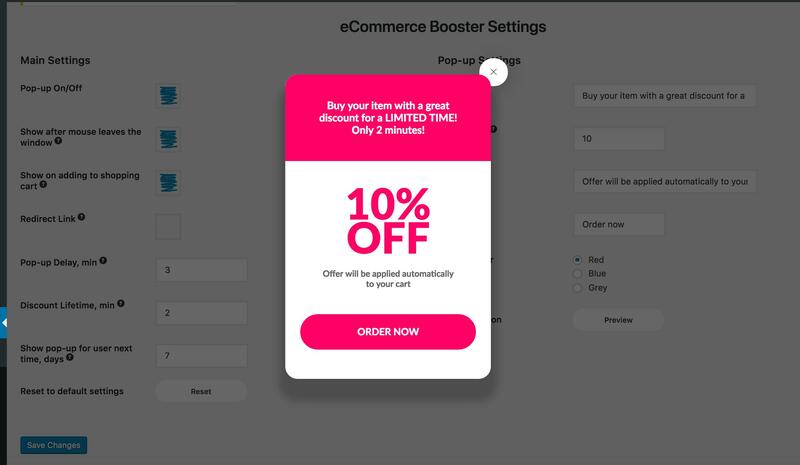 After user adds your product to shopping cart and does not proceed to checkout for some period of time or move his mouse out from your website the pop-up will propose him to buy the item/items with discount. 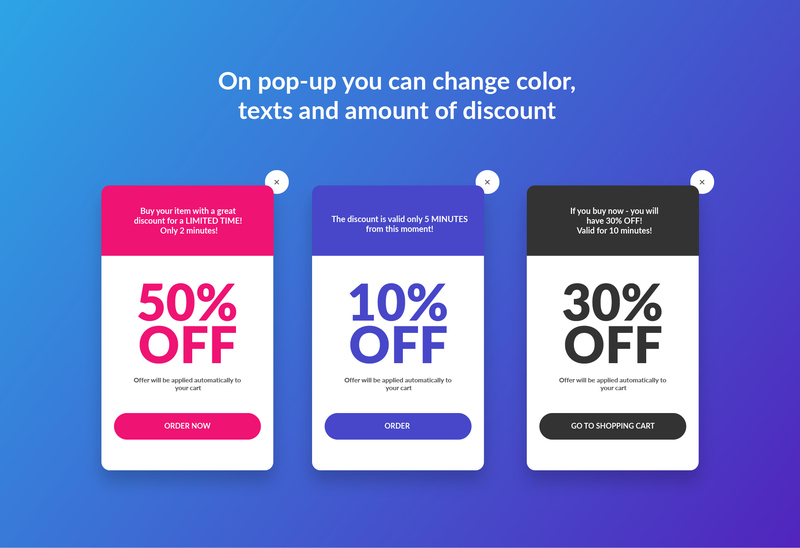 You can choose the period of delay, exact amount of discount as well as color and text of pop-up to attract the users’ attention. It is easy to use and fully customizable through the admin panel. With eCommerce Booster, you can sit back and watch your sales rise sky-high! Title – Buy your item with a great discount for a LIMITED TIME! Оnly 2 minutes! 2. Upload archive file to the menu in WordPress. 3. Activate the plugin through the \’eCommerce Booster\’ menu in WordPress. 2.Activate the plugin through the \’eCommerce Booster\’ menu in WordPress. Q: How to enable our pop-up? A: It is enabled by default. To enable/disable pop-up and go to the WordPress menu and navigate to the eCommerce Booster tab. Find ‘Pop-up On/Off’ field and click on checkbox. Q: How to reset to default settings? A: In eCommerce Booster settings tab click on button ‘Reset all settings’. Then click “Save changes” if you wish to apply the changes. Q: How to customize the pop-up? A: You can add your own values in the input fields. Then click on the ‘Save changes’ button. Q: How does the ‘Show after mouse leaves the window’ option work? A: Enabled: when the user’s cursor leaves the window the pop-up will appear. This feature can be enabled/disabled through the settings panel. Q: How does the ‘Show after mouse leaves the window’ and ‘Show on adding to shopping cart’ function together? A: If both of these options are enabled, only one pop-up will appear after action which was triggered first. IE: If the user adds an item to the cart and moves the cursor away from the window, only ‘Show on adding to shopping cart’ will be triggered.